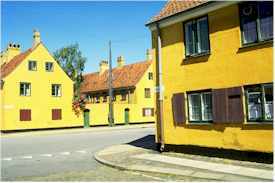 ABOVE: The yellow houses of the Nyboder, near Kongens Nytorv, were built in the 17th Century as sailors' quarters and are still used by the Danish Navy. "The young and the young in heart" are the target audience for the Euroglobe, which has 46 singles, doubles, triples, and quads. The one-star hotel is located in the Frederiksberg district. The centrally-located, two-star City Hotel Nebo belongs is owned by a non-profit organization that donates its proceeds to the homeless community. Rooms have private or shared bathrooms (depending on rate), and free Wi-Fi is available throughout the hotel. In summer, breakfast is served on an outdoor patio. All rooms have washbasins, and some have private WCs at this simple tourist-class hotel near the N�rreport S-Bahn and Metro station in downtown Copenhagen.